Grinding up dewy green herbs and red-clay earth is easy, but how do you bottle the twilight-blue of the evening sky or capture the storm-tossed indigo of the ocean? Since humans first began to depict the world on cave walls, blue has proved to be an elusive pigment. The only naturally-occurring blue pigment comes from the semi-precious stone, lapis lazuli, found deep within the mountains of modern-day Afghanistan and Pakistan. Due to its unique locale, it was quite an expensive pigment, so to find a more accessible and less costly alternative, the ancient Egyptians created the world’s first synthetic pigment, Egyptian Blue. They made this blue by heating together silica, limestone, and copper carbonate . Over the centuries, artists and scientists have created more blues, ranging from Prussian blue coloring the canvases of Van Gogh and Picasso to Cobalt blue, a favorite of Impressionists like Renoir [2, 3]. Since the manufacture of Cobalt blue over 200 years ago, however, the creation of new blue pigments had come to a halt. That is, until one day in 2009, when an Oregon State University chemistry graduate student pulled open a laboratory oven to find a dusting of brilliant blue . Unfathomable at the time, this new blue would not only provide a new way to color the world, but it would hold the potential to conserve energy and even to inspire the creation of a new Crayola Crayon. Lapis lazuli, the sole naturally occurring blue pigment, is only found in modern day Afghanistan and Pakistan. Image credit: Ra'ike licensed under CC BY-SA 3.0. The ancient Egyptians developed the first synthetic pigment, Egyptian Blue, seen here as a pigment (left), in a figurine (center), and in pottery (right). Image credits: Dan Diffendale licensed under CC BY-NC-SA 2.0 (left), abrinsky licensed under CC BY-NC-SA 2.0 (center), and Walters Art Museum licensed under CC BY-SA 3.0 (right). On an otherwise ordinary day, graduate student Andrew Smith in Professor Mas Subramanian’s laboratory was investigating multiferroic behavior of materials called transition metal oxides. Multiferroic materials are incredibly unique because they have both ferroelectric and ferromagnetic behaviors, which are rarely seen together in the same material. Ferroelectric materials can spontaneously become polarized – meaning that one side of the material will have a positive change and the other, a negative charge. Similarly, ferromagnetic materials can become permanent magnets, a common example being a refrigerator magnet . Figure 1: A trigonal bipyramid arrangement of atoms has an atom in the center, in this case manganese, and other atoms, in this case oxygens, surrounding it such that three of them lie in the same plane as the center atom and the two other atoms are directly above and below the center atom, thus creating the shape of two pyramids with triangle bases sitting on top of each other. Image credit: Oregon State University licensed under CC BY-SA 2.0. The combination of ferroelectric and ferromagnetic properties in one material gives it new physical properties that can be used to develop better sensors, data storage technology, and energy harvesting devices . In this case, Smith and Subramanian were studying the ferroelectric and ferromagnetic properties of the transition metal oxides yttrium manganese oxide (YMnO3) and yttrium indium oxide (YInO3). 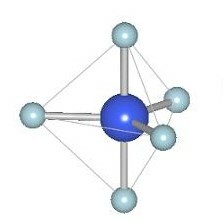 In YMnO3, the manganese atom sits in the middle of oxygen atoms configured in a trigonal bipyramid – a structure where the flat triangle bases of two pyramids sit on top of one another (Figure 1). This arrangement of atoms gives YMnO3 rare multiferroic behavior. YInO3 is also arranged in a trigonal bipyramid structure and exhibits ferroelectric behavior, so by combining the two metal oxides at high temperatures, Subramanian and Smith hypothesized that the resulting material might exhibit enhanced ferromagnetic or multiferroic behavior. 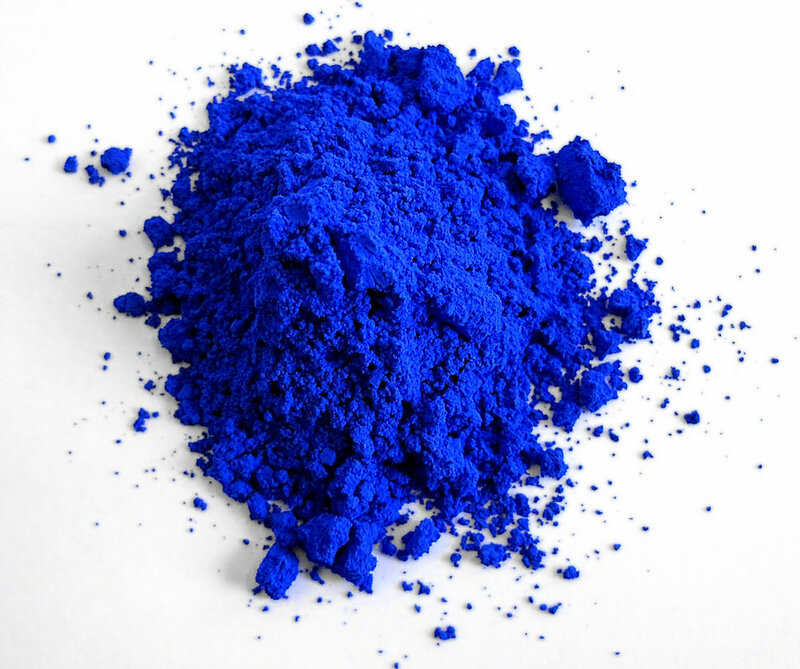 YIn0.8Mn0.2O3, also known as YInMn Blue, is the first new blue pigment in over 200 years. Image credit: Mas Subramanian licensed under CC BY-SA 4.0. Objects are colorful due to how light interacts with their atoms, specifically the electrons in those atoms. Arranged in different energy levels orbiting the nucleus of an atom, an electron can become “excited” to a higher energy level if light with a specific wavelength shines on it. Because this excited state is unstable, the electron will fall back down and in doing so, release light of the same wavelength it received initially. On the other hand, if the incoming wavelength of light is not one that can excite an electron to a higher energy level, it is absorbed by the atom, and no light is reflected. Smith explains that in YIn0.8Mn0.2O3, “the bond between the manganese and the oxygen [atoms] above it and below it are much shorter than the indium-oxygen bond distances, and so the crystal structure allowing those to be different, made [YIn0.8Mn0.2O3] able to have an energy level that will produce color… It's unique because manganese has four electrons, and indium has none available. It creates an intermediate energy level where an electron can be excited.” Thus, when incoming light shines on YIn0.8Mn0.2O3, its unique arrangement of atoms absorbs all colors of light from red to green but reflects blue light, resulting in the bright blue color that we see . 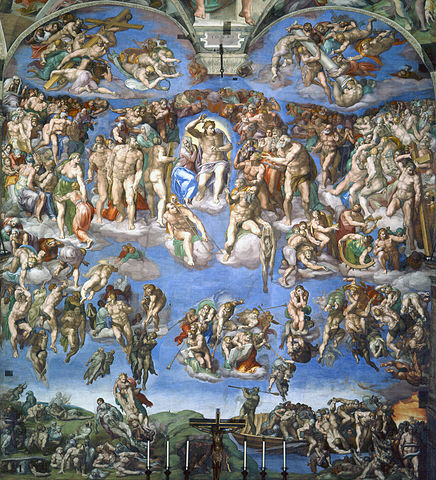 Michelangelo used the fading-prone pigment, ultramarine, to create his The Last Judgement fresco in the Sistine Chapel. Image credit: Public domain. Color stability has been a considerable problem for blue pigments over the years. In fact, visitors to the Sistine Chapel in Rome were astounded by a recent restoration of Michelangelo’s Judgement Day fresco to its original blue . Michelangelo’s ultramarine pigment, made from lapis lazuli, fades over time as the structure of the pigment breaks down. Another blue pigment called smalt, a mix of cobalt and glass, faces a similar problem. Smalt derives its blue color from the arrangement of cobalt and potassium atoms, but as time goes on, the potassium atoms leech out of the pigment, disrupting the structural arrangement of the cobalt atom and cause the pigment to lose its blue color . 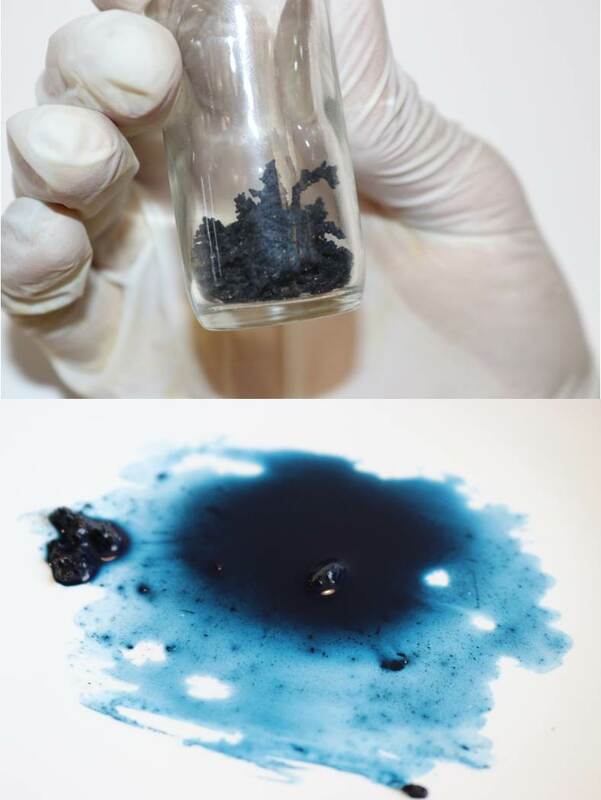 And so, YIn0.8Mn0.2O3 or as it’s now known as a pigment ̶ “YInMn Blue,” was subjected to anything scientists could throw at it to test its pigment suitability. Because both YMnO3 and YInO3 are stable at high temperatures and YInMn Blue was created at such high temperatures, it too is thermally stable. Additionally, to check for fading, the Subramanian lab bombarded YInMn Blue with UV rays. UV rays have higher energy than visible light and readily breakdown the chemical bonds in the plastic polymers that are typically used as binders for the pigment particles . This breakdown of the binder results in an overall fading effect. However, if the pigment is able to absorb more UV light, it helps prevent fading. The Subramanian lab found that YInMn blue absorbed more UV rays than the commonly used Cobalt blue, indicating that it is much less prone to fading . In addition to absorbing UV light, the Subramanian group discovered that YInMn Blue reflects infrared light, also known as heat . This ability to reflect heat makes YInMn blue a very attractive pigment to use in outdoor coatings. If rooftops, for example, were coated with YInMn Blue, they would absorb less heat than another similarly colored roof. This property would result in less heat transferred to the building and thus less energy needed to cool it, saving energy and reducing costs. In fact, Shepherd Color Company, taking advantage of this sustainable property, is currently developing YInMn Blue for use in plastics and coatings . One final important pigment property is toxicity. Scheele’s Green, a common green pigment in the late 1700s, was used in everything from candles to wallpaper, but with the briefest exposure to moisture, it would release poisonous arsenic gas . Over the years, blue pigments have faced similar problems with toxicity. While Cobalt blue, for example, may be very stable, it is toxic if accidentally inhaled or ingested . Similarly, under even slightly acidic conditions, the typically stable and otherwise non-toxic Prussian blue releases hydrogen cyanide, an incredibly poisonous and reactive acid . YInMn Blue, on the other hand, is made of non-toxic materials, making it a vast improvement over the other more toxic blue pigments available . 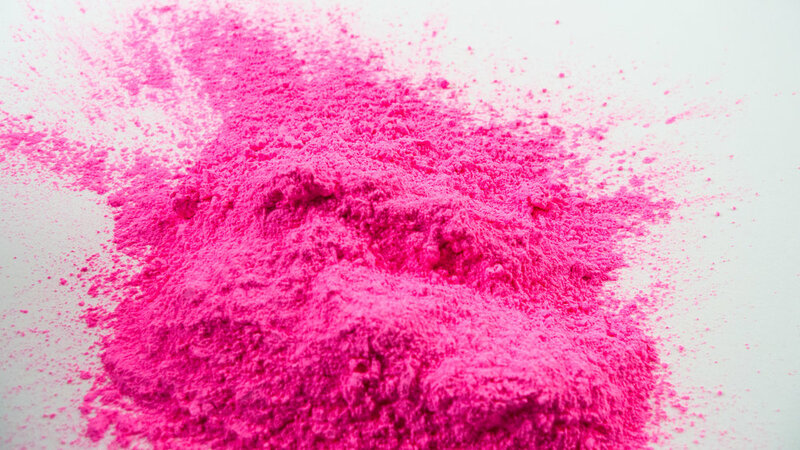 Stuart Semple’s PINK pigment is thought to be the “pinkest pink.” Image credit: Stuart Semple reprinted with permission. Stuart Semple recently created a brand new blue pigment, shown here as the pigment particles (upper) and mixed with water on a surface (lower). Image credit: Stuart Semple reprinted with permission. Artists and technology companies are always trying to make new pigments whether for use in art or other technological advancements. Stuart Semple, for example, has worked for over fifteen years perfecting his highly reflective pink pigment simply called “PINK,” thought to be the most vibrant pink pigment to date . Similarly to the Subramanian lab, Semple just discovered a brand new blue pigment completely by accident. Semple describes this currently nameless blue as, “a kind of ocean blue. It's got like a sort of turquoise kind of shimmer to it. It's beautiful. When we saw it, I was like, ‘Whoa that's actually a gorgeous blue!’” He doesn’t know whether it will be useful in art yet, but he explains how rare it is to create a blue like this: “The color seems very very unique, and ordinarily to get a similar hue of blue, you'd be mixing pigments together, so you wouldn't be using a pure pigment to make a color like that. It would normally be a mixture of a few different things… And the other thing is it's different. The way it reacts to water is different as well. It's quite strange, we tried to bind it into an acrylic paint last week, and it's really weird! It almost resists. It doesn't emulsify.” In addition to happening upon this new blue, Semple is working with a laboratory in Dallas to create the most matte black pigment available. Also, interested in black pigments, the British company Surrey Nanosystems has used carbon nanotubes to make “Vantablack,” a pigment so dark that it absorbs 99.96% of light. As light hits the nanotubes, it bounces off other nearby nanotubes, never leaving the so-called “nanotube forest,” which results in essentially no light escaping from the material. Surrey Nanosystems explains on its website that “it reflects so little light that it is often described as the closest thing to a black hole we’ll ever see” . These amazing light absorbing properties did not escape the notice of Berlin Space Technology and the National University of Singapore who used Vantablack to coat the star-tracking observation equipment on one of their satellites currently in orbit to minimize interference from stray sunlight . From the ancient Egyptians to modern day scientists and artists, we are still finding new ways to mimic the azure waves of the ocean and the cerulean scales of its fish. Through a deeper understanding of the chemical structures of pigments, we can produce longer lasting, safer, and more sustainable colorings so that the art and innovations we create last for the enjoyment and benefit of future generations. Pigments give us a way to depict our world and express what exactly it means to us, all with the flick of a brush or a scribble of Crayola’s new “Bluetiful” YInMn Blue crayon. Allen, N. & Edge, E. Fundamentals of polymer degradation and stabilization. Springer Science & Business Media (31 Oct, 1992), pp. P75-P95. Scheele, C. W. Försök, beträffande det färgande ämnet uti Berlinerblå (Experiment concerning the coloring substance in Berlin blue), Kungliga Svenska Vetenskapsakademiens handlingar (Royal Swedish Academy of Science's Proceedings), 3: 264–275 (in Swedish). (1782).